Elsbethen is a prosperous village on the verge of Salzburg, directly south of the city. It has a population of approximately 5,000 and is accessible via city busses from Salzburg. This means that despite of its administrative autonomy, Elsbethen effectively feels like a part of Salzburg - and real estate prices support this feeling. The main part of Elsbethen is sandwiched in between the city and parts of the Gainsberg mountain. In terms of landscape, the community is actually really lucky: There are gorges such as Glasenbachklamm or the Trockene Klamm that offer great hiking opportunities; on the other side, there is the opening plain of the Salzburger Becken. The Glasenbachklamm is a popular destination for easy hiking from Salzburg and covered in a separate article. 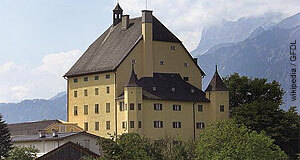 Elsbethen was first mentioned in a written document in 930 and benefited from its vicinity to Salzburg for centuries. Apart from the various hiking pats into the Gaisberg region and the Glasenbachklamm, Elsbethen has two main attractions: One is the palace of Schloss Goldenstein, once the castle of the local landlords. It is a picturesque building and houses a private school for girls. The Austrian actress Romy Schneider, famous for her unfortunate Sissi-movies, attended this school as a child. Schloss Goldenstein is an impressive building from outside, but not open to the general public. It can be found in the historic core of Elsbethen, just like the Gothic parish church. The other "big" attraction of Elsbethen is the town museum. It shows an impressive array of fossils that were found in the Glasenbachklamm alongside with historical items. Note that the marine dinosaur that was once found in the Glasenbachklamm is on display in the Haus der Natur. A focus of the Elsbethen town museum lies on the production of gun powder, which was a big deal in the village until 1918. Other noteworthy things about Elsbethen: One of Austria′s best-preserved Neolithic graves was found here alongside with all sorts of tools and gifts; there is an army base (Kaserne) is Glasenbach; and after WWII, the American troops maintained a camp for local Nazi officials and war criminals that awaited their trail (or release, which was much more common) behind bars in Elsbethen.